I think maybe I'm not cover enough for The Sandman series. Or maybe I haven't read enough. In no way though does this detract from this graphic novel. 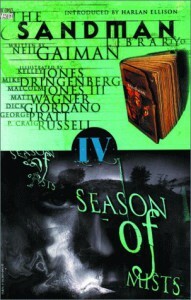 It gives you nightmares, makes you think and reminds you what a genius Gaiman is. The idea of everyone coming back to 'life' from hell is very creepy and Gaiman's interpretation of all the different gods is fascinating. Highly recommended.